Going Vintage was a cute story. It is a simple book to read that doesn’t involve sexual scenes or cussing. I really enjoy reading realistic fiction. The book is set in Orange, CA with 16 year old Mallory as the main character. After finding out that her boyfriend is having an emotional affair, Mallory decides to go vintage. She wants to live like she is 16 years old in the early 60s. She has decided that it was a much simpler time and growing up in a technology age. She gives up her computer, cell phone, cordless phones…..most things that we’re available when her grandmother was 16. With a list she found written by her grandmother at the same age, she decides she is going to complete the list before using technology again. The story takes you through her journey to finish the list. During that time Mallory learns more about herself in the couple of weeks than she has learned in her 16 years. One reason I wanted to read this was the cover. 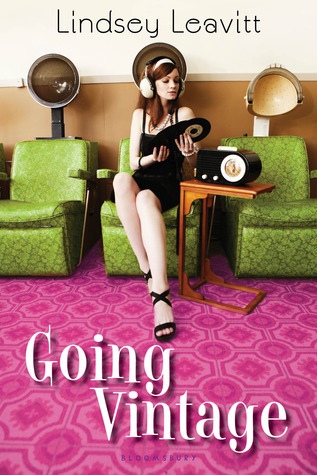 It is such a beautiful cover…….and I love the thought of going back to the early 60s. While looking through the different eras, you can see that each had it’s own problems…..and when it comes to teens and their problems some are still the same. No time was a perfect time to live. If you are grown now, can you remember when you were 16 and the worries that you had? LoL and that is why I am happy I had a son instead of a daughter! From the time I was 15 until I was 27 I have had 5 boyfriends….and each of them have proposed at some point during our relationship. I don’t miss relationships, and I don’t miss being a teenager! I don’t have much longer to go until my son is a teen. He hits double digits this year.